I just heard from Wilbur Smith. He and his wife just returned from a 7-day Alaskan cruise. I don't know how arduous such an endeavor is compared to, say, a visit to Olongapo City on the USS Blue Ridge, but I'm sure Smitty will have sea stories. I don't understand Facebook. Yeah, I use it, but I really don't know how it works. Things show up, disappear, and you never know where anything is going and who can see it. I just visited the Navy Musicians Association Reunion page, and the entire list of people attending is David Blakely, Deb Holl and me. Now, I know this isn't true. But, just in case, it looks like maybe we can form a trio. Deb--do you play the bass? It is imperative that I obsess about Saturday's weather, since that's the day I'm flying out of here. NOAA says, "Mostly sunny with a slight chance of showers and thunderstorms." I'll go with "mostly sunny." 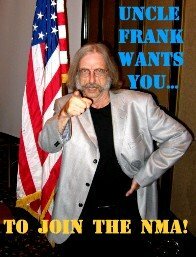 If you haven't made a 100% decision about attending the NMA reunion next week, it's not too late to say what the hell. You can register for the reunion and book your room at the hotel by phone--info is right here. Or you can put it off for another year. Just remember, next year, you'll be a year older--if you're lucky.